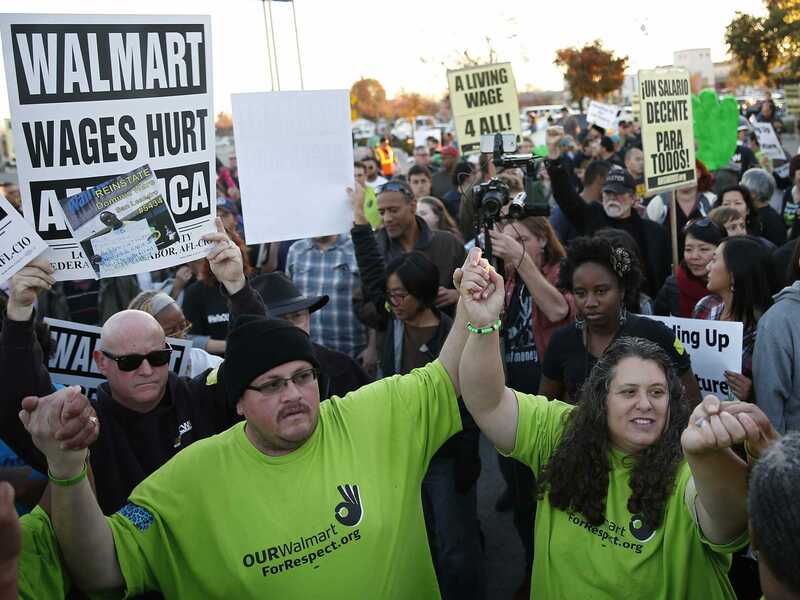 ReutersProtestors gather outside a Wal-Mart in California on Black Friday in 2013. Wal-Mart workers and labour groups are planning strikes and protests at thousands of Wal-Mart stores across the country on Black Friday to demand higher payer and better working conditions. Protests are planned at more than 1,600 Wal-Mart stores, according to the union-backed group OUR Walmart, which is organising the demonstrations. The protestors are asking Wal-Mart to pay workers at least $US15 an hour and to provide more opportunities for full-time work. The group claims that most Wal-Mart employees make less than $US9 per hour, an estimate based on data from IBISWorld and Glassdoor.com. Wal-Mart pegs the figure at $US11.83 for full-time and part-time employees, and $US12.83 for full-time employees. OUR Walmart was formed two years ago after unsuccessful attempts to unionize Wal-Mart employees. It’s the same group that has led widespread strikes and protests at Wal-Mart stores for the past two years on Black Friday. The protests will be similar in scale to last year’s, which took place at more than 1,500 stores, according to organisers. Wal-Mart says last year’s demonstrations actually involved fewer than 250 stores and that less than 20 employees participated, however. “It’s not unusual for this union group to make bold predictions and fail to deliver,” Wal-Mart spokesman Kory Lunderberg told Business Insider. He said it’s unlikely that this year’s protests will impact sales on Black Friday, one of Wal-Mart’s busiest shopping days of the year. “For the last two years we have had best Black Friday events ever,” despite the protests, Lundberg said.